During the military dictatorship in Greece, DW made journalism history. A small group of conspirators led by colonel Georgios Papadopoulos, lieutenant-general Stylianos Pattakos and general Georgios Zoitakis executed a coup d'etat late on April 21, 1967. That night, the first wave of arrests swept Greece. An estimated 8,000 people were detained, among them sitting ministers, countless journalists, lawyers, writers and artists. The parliament was disempowered, tens of thousands of people - in particular those leaning to the political left - were jailed and banished to island prisons. The seven years of the military regime were marked by despotism, extensive censorship, torture and murder. Thousands were killed. DW started broadcasting its Greek-language program from its then-headquarters in Cologne in 1964. After the military seized control in Greece, the program gave a voice to critics of the new regime. DW was one of the few outlets available to Greek citizens that provided unrestricted information, making it a thorn in the junta's side. Every day from 9:40 to 10:40 p.m., DW broadcasted news, opinion pieces, press reviews, features on the events in Greece and interviews with anti-regime activists. Greek music was also part of the program. This included tunes that had been banned by the military dictators, such as the songs of composer and famous opposition supporter Mikis Theodorakis. People from all walks of life with widely different political views were part of DW's Greek department. The one thing they could all agree upon: A military dictatorship was not acceptable. Pictured here: G. Heyer, A. Maropoulos, G. Kladakis, D. Koulmas, K. Nikolaou (from left to right). When she arrived in Berlin, Melina Mercouri was greeted by German novelist Günter Grass. Merkouri was a successful Greek actress, singer and politician who had left her home country for exile in France in 1967. "The military junta is a disgrace for a democratic Europe," Merkouri said when she visited Germany's biggest city on an international protest tour against the regime. The regime systemically disrupted DW's shortwave signal. Newspaper "Nea Politeia" - a mouthpiece for the Athens regime - tried but failed to damage the reputation of the DW editorial team. "The rodents of the Cologne radio broadcaster;" read the title page of their June 8, 1969 issue. But 3 million Greeks still followed the broadcast every night. "When Greek composer Mikis Theodorakis conducted the performance of his own songs in the sold-out concert hall yesterday, the concert was spontaneously turned into a demonstration after the intermission by the many Greeks attending the event," newspaper "Hamburger Abendblatt" wrote after Theodorakis' performance in Hamburg on Februar 2, 1972. 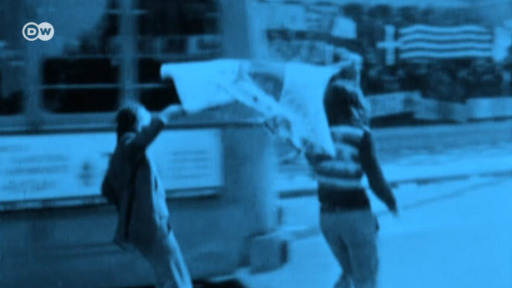 On November 14, 1973, students of the Polytechnic in Athens went on strike to protest against the regime. They barricaded the campus and opened a radio station. Their voices were broadcast across Greece by DW. The student boycott marked the beginning of the end for the dictatorship, which ultimately collapsed in Mid-1974. The myth of DW as the "voice of freedom" lasts to this day. Once a place of horror, the secret prison island of Yaros in the Aegean Sea may soon have a new lease on life. But after a long and painful past, the transformation is no easy task.